It’s hard for any dog lover to imagine a breed simply becoming extinct. But decades ago, dogs fell into favor largely due to their purpose: If a breed fulfilled a need of the times, they were in demand; when those needs changed or shifted, the breed either died out or evolved. Health issues were also a factor — a breed susceptible to illness, or unable to mix well with other breeds, soon declined. Here are 10 notable breeds that have become extinct. Like other early hairless dogs, the African Hairless Dog — also referred to as the Abyssinian Sand Terrier — was thought to possess magical healing powers. This was due to its warm, furless body, which was used as a hot compress against aches and pains. The dogs were also effective bed warmers. 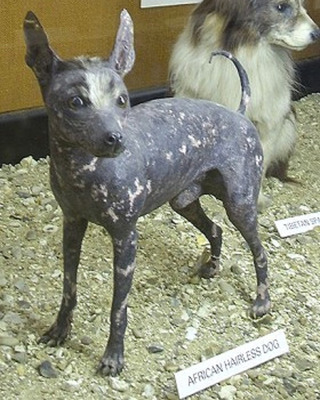 Now extinct, a preserved African Hairless Dog is on display in England’s Walter Rothschild Zoological Museum. This breed is thought to be entwined in many hairless breeds today, including the popular Chinese Crested dog. Legend links the origins of this ruthless fighting dog with sailor John Paul Jones, who was credited for introducing blue terriers into Scotland. 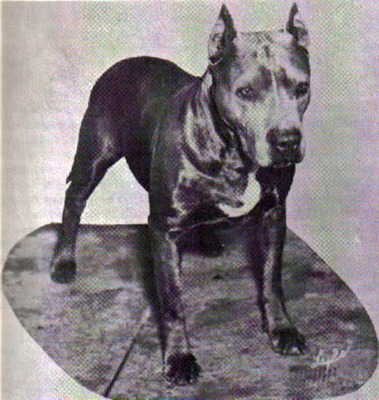 With a bluish tinged coat, this dog was common in U.K. and U.S. in the mid-1800s when dog fighting was widespread entertainment. No dates are linked to its disappearance, but estimates place it between 1850 and 1900. Theories suggest that, after being crossed heavily with American Pit Bull Terriers and Staffordshire Bull Terriers, the Blue Paul has evolved into those breeds. 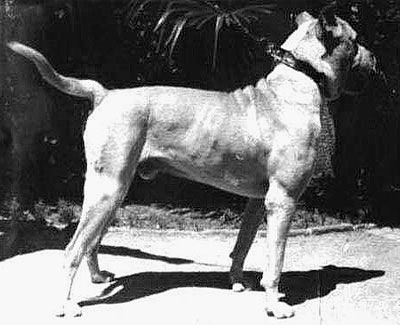 A fighter, hunter, and a guard dog, this strong and tenacious breed was named for its native region of Cordoba, Argentina. Origins were thought to come from crossing the Bull Terrier with several other strong breeds, such as the Alanos and the Staffordshire Bull Terrier. A solid white coat was favored, but brindle and fawn were also options. This large dog was extinct by the mid-20th century. Their fierce muzzle and fox-like build may seem uninviting, but the Kuri was a domesticated dog, a companion, and also source of fur and meat. Kuris arrived with canoe-bound settlers to New Zealand in the 13th century. 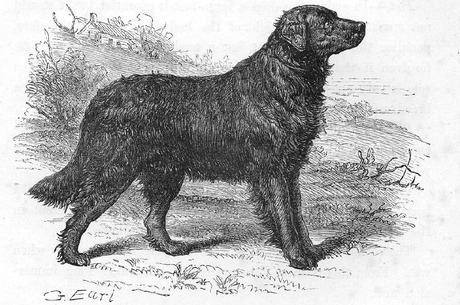 By the early 1860s, the breed was extinct, blamed on its inability to survive interbreeding with European dogs. Three taxidermy examples of Kuri dogs remain, which are highly coveted at auctions. 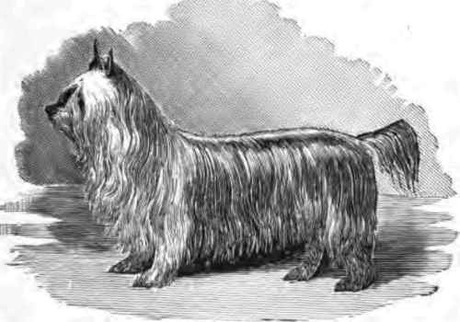 Originally from Paisley, Scotland, this small dog resembles today’s Yorkshire Terrier. A show dog and a devoted companion, this silky-coated dog insisted upon both togetherness and attention, and would bark or exhibit depression if left alone too long. Their long, soft coat was striking but grooming-intensive, seen in shades of tan or blue. The breed began its decline in the late 1800s. This Labrador look-alike had its glory days in the 16th century, when fishermen in Newfoundland relied on their ability to haul lines and retrieve ptarmigan and seals. A government tax imposed on any dog not associated with the production of sheep contributed to this breed’s decline. While two males were documented in the 1970s, they could do little to prevent eventual extinction. One of the oldest scent breeds, this dog dates back to the 1400s in Southern England and Wales. With a keen nose that could detect day-old trails, it was a slow but effective tracker of deer, a popular sport during the end of the Renaissance. When tastes migrated toward the faster sport of fox hunting, this methodical and deliberate tracker frustrated hunters, who began crossing their dogs with speedier canines. 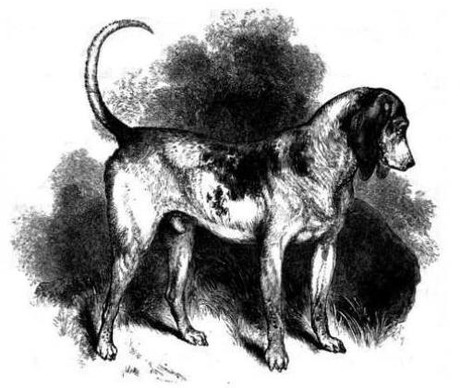 The Southern Hound led to the development of subsequent scent hounds, including the Foxhound, Bloodhound, and Beagle. The Turnspit gives new meaning to the label “working dog.” Small with short legs, this dog ran on a wheel that rotated a spit in the fireplace, turning the meat to cook evenly. To protect the dog from overheating, the wheel was situated high on a wall, away from the blaze. British kitchens in the 16th century would typically keep two Turnspit dogs, so they could alternate work days. When a mechanical spit turner was developed in the 1800s, the breed began to fade away. A taxidermy reminder remains in a museum in Wales. Records indicate today’s Golden Retriever may have this dog to thank for its origin. 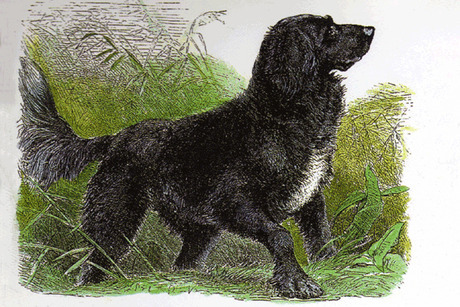 The Tweed Water Spaniel was an intelligent bird and waterfowl hunter and adept, water-resistant swimmer. Thought to originate from a cross of non-specific water Spaniels with other established breeds, such as the St. John’s Water Spaniel, this eager worker was invaluable to fishermen in the region of Berwick-upon-Tweed, in Northern England. The dog became extinct by the end of the 19th century. 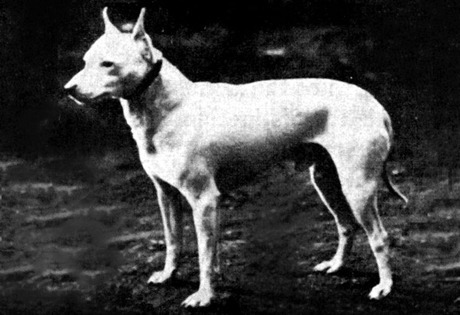 This small, all-white dog was one of the first breeds developed for show. 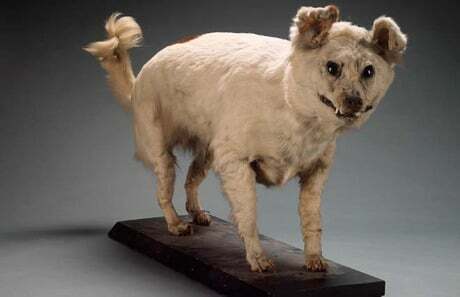 Efforts toward its creation were concentrated on the 1860s and 1870s, when a group of dog fanciers were intent on developing a prick-eared version of a small, white working Terrier. However, both prick-eared and drop-eared offspring persisted in the same litter. 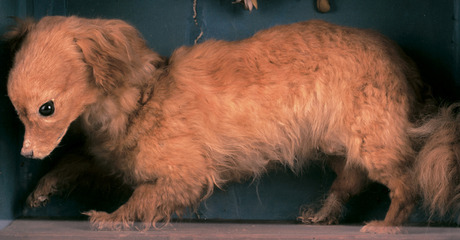 The breed was plagued by health problems and deafness, and died out in the early 20th century. Having been crossbred with the English Bulldog, the White English Terrier is thought to have given rise to the Boston Terrier and Bull Terrier.